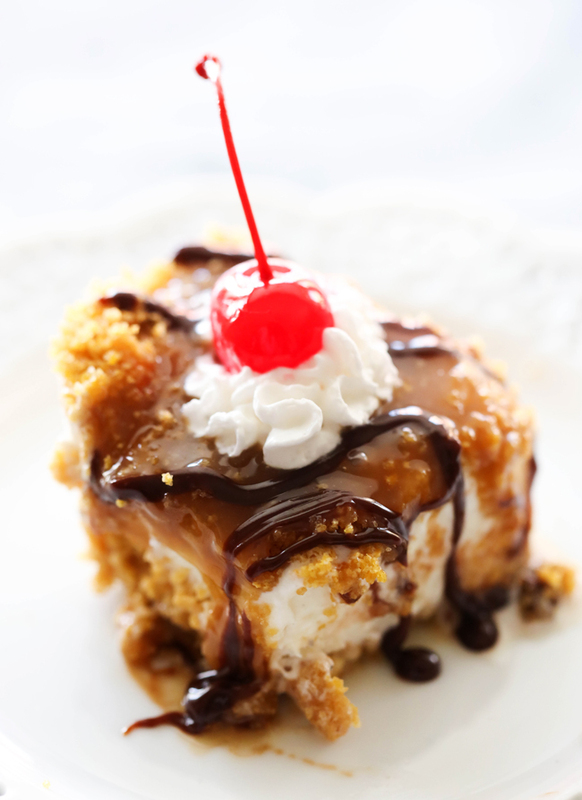 This Fried Ice Cream Cake is everything you love about fried ice cream, wrapped up into one delicious dessert! It eliminates the fry and tastes JUST like the original but with a fraction of the work. This recipe is a MUST TRY for any gathering. It will be the hit of the PARTY! Fried Ice Cream is easily one of my top favorite desserts of ALL TIME! The flavor, the crunch, the caramel, the chocolate… it is absolutely heavenly! My mom and I recently took a girls trip together. For dinner one of the nights we went t o a Mexican restaurant and of course had to order some fried ice cream for dessert. We got talking about how much we both loved this dessert but hated how time consuming making and frying all the balls were. We then talked about these Crispy Ice Cream Balls and the Krispie Ice Cream Dessert on my blog and how brilliant it would be to combine the two into one no hassle Fried Ice Cream Cake. WOW! Let me just say this recipe is OUTSTANDING! Definitely one of my new favorites on the blog and it is SO easy! 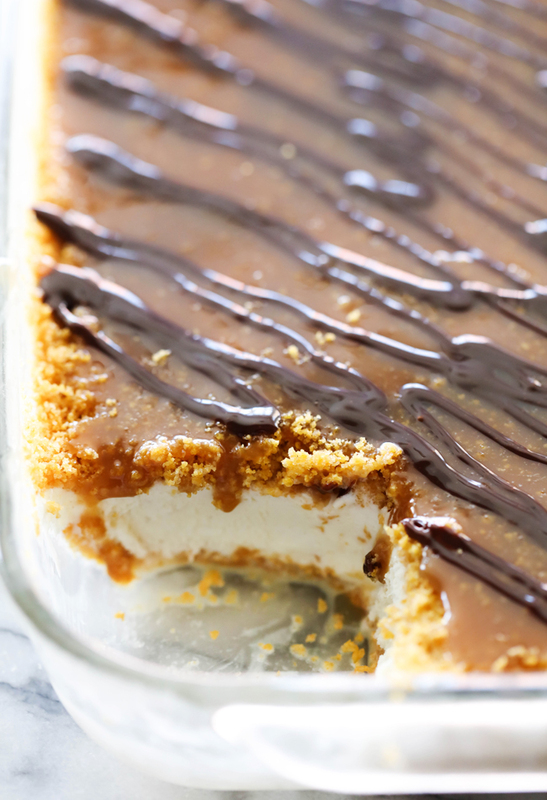 Trust me on this, you are going to want to make this dessert! In a medium sauce pan, melt butter over medium heat. Boil for 2 minutes then remove from heat. Stir in the cornflakes and cinnamon until well combined. Divide corn flake mixture in half and press evenly over the bottom of a 9x13 baking dish. Spoon softened ice cream evenly over corn flake mixture. Carefully smooth with a knife. Sprinkle the remaining corn flake mixture evenly over the top. Place dessert in the freezer for at least 3 hours or until well set. To serve: Drizzle dessert with caramel ice cream topping over the majority of the top of cake. Carefully spread as needed to cover. Cut into square pieces and serve with whip cream and a cherry. Dear Nikki, you really prepare great meals. No doubt, this one is "must do" for tomorrow since there is big gathering at my place and I have just added the ingredients to my shopping list. Thank you so much !